With thousands of player-created The Escapists 2 prisons already available on Steam Workshop, there are definitely a ton of amazing creations out there. We want to celebrate the immense creativity among our players, and what better way than by holding a Prison Design Contest! 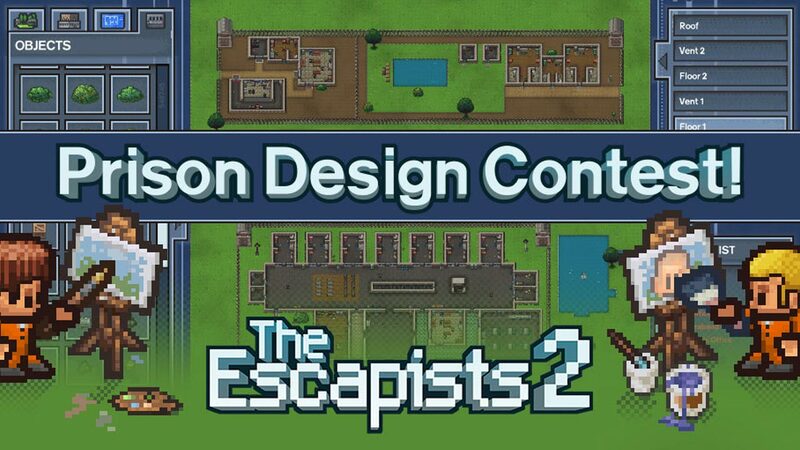 Whether you’re an experienced creator or are all new to the tools of The Escapists 2 Prison Editor (Pssst, find tips here), we’d love to see your creations. We’re leaving it open too, meaning you can create your prison(s) any way you want. Any theme, any tile-set, any objects, anything. Just be sure you’re not breaking any of Steam’s guidelines. You can publish as many prisons as you want within the competition period, as long as you include the word “Contest” in the prison name (so we can find it!). Feel free to be creative with this. We knew you’d ask and creativity is key here. You can turn your prison into a piece of art by “drawing” it using the buildings, objects, tile-sets and more. You can make a prison based on something in the real or fictional world. You can create your dream (or nightmare) prison, a resort-type prison, a water world prison or whatever else you feel like. Just keep in mind; it has to be playable, and it must be possible to escape. And you can’t copy someone else’s creation! If you’d like further inspiration, we’d encourage you to check out some of the existing masterpieces on Steam Workshop, or some of the custom prison videos available on YouTube. Should you have any questions about the competition, come say hi on Facebook, Twitter or Discord. Good luck, and have fun creating! This promotion is in no way sponsored, endorsed or administered by, or associated with, Steam, Facebook, or Twitter. The promotion commences at 15:00 GMT Wednesday 7th March 2018 and closes at 23:59 GMT Wednesday 21st March 2018 (The “Promotion Period”). To enter the Competition, entrants must: a) Sign into their Steam account b) Publish one/multiple prison maps c) Include “Contest” in the prison name(s). There will be two winners. Each winner will win a £20 Steam Wallet Top-Up.